GrandWay 024 ACWP is a fixed blade bowie knife. The distinctive features of the knife, such as the guard, clip point and fullers, that are not obligatory for the puukko, were formed on the territory of the Russian Empire. Bowie knife or shiv was especially popular with criminal gangs of large cities. This is a pretty large knife with a straight mirror polished blade and clip point made of 440C steel. 440C is a corrosion-resistant chromium steel developed in the USA, known for its high enduring quality, strength and hardness. To ensure transverse stiffness, the blade is provided with a fuller and has a false edge. The handle of the knife has an ergonomic shape and is made of rosewood, has an oval cross section and a metal pommel. The wood used in the manufacture of the handle was pretreated and resistant to moisture, rot and pests. The handle is provided with a hole for the sword knot. The sword knot will allow you to free your fingers to do any work without releasing the knife from your hand. Strong and sturdy nylon sheath comes with this knife. Such a variation of Finnish knife could be the best gift for birthdays, men days, any date or occasion to make nice to your dad, father, brother, co-worker, boys and guys. 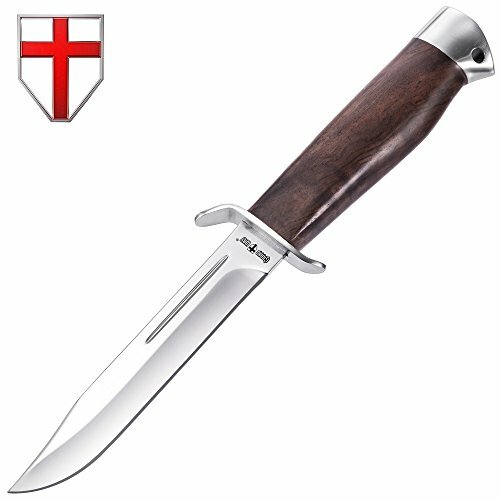 HUNTING KNIFE WITH CLIP POINT BLADE AND NATURAL WOOD HANDLE provides superior control when using for any utility purposes. The blade is sharpened on one side and reinforced with the fuller. The handle is protected with a metal bolster and has both a guard and a lanyard hole. LARGE MULTIPURPOSE KNIFE FOR EVERYTHING - Camping, Hiking, Backpack, Bushcrafting, Hunting & Fishing, Military & Army needs, Outdoor & DIY Activities, Survival, Self Defense, Emergencies. 440C STAINLESS STEEL - excellent balance of hardness and corrosion resistance ensures proper operation without sharpening. Provides razor sharp cutting performance and high durability. The best knife in your tactical or camp knife set. 100% MONEY BACK GUARANTEE - your new knife is protected by GrandWay 10-year warranty. A perfect gift for men or women in your life.